​Frank Einstein loves figuring out how the world works by creating household contraptions that are part science, part imagination, and definitely unusual. After an a lightning storm brings Frank's inventions--the robots Klink and Klank--to life! Not exactly the ideal lab partners, the wisecracking Klink and the overly expressive Klank nonetheless help Frank attempt to perfect his Antimatter Motor . . . until Frank's archnemesis, T. Edison, steals Klink and Klank for his evil doomsday plan! What type of robot would you create if you were Frank? Would you like to read something else by this author? Why or why not? 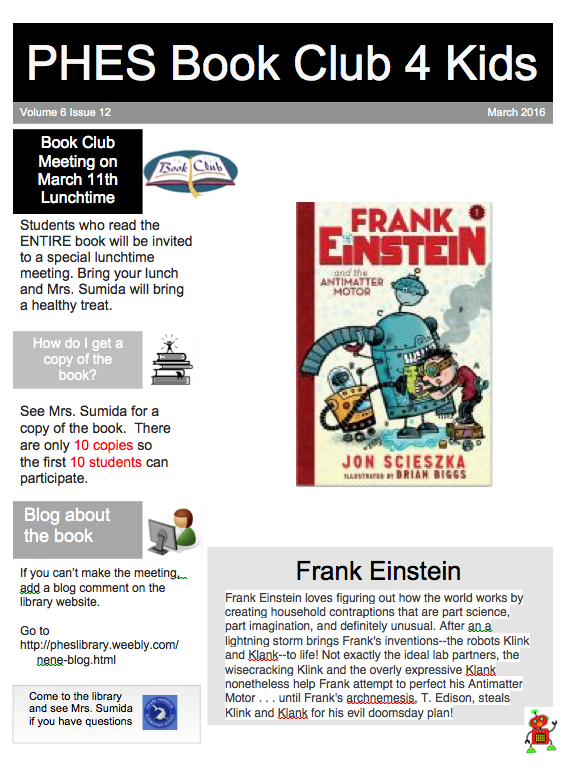 All students who leave a message will be invited to a special luncheon in the library to discuss the book on March 11th. See Mrs. Sumida for a copy of the book.